I make it short: Laura Ximena Villanueva Guerra quite official has the most beautiful job in the world, naturally lives her personal dream, glamour our senses every day and provides us with pure luck. How she do that? She combines the most delicious recipes with the most beautiful flower bouquets, sits on natural decorations instead of their pastry with Fondor to kill marzipan and sugar sets and created an explosion in the mouth from the most unusual ingredients. 4 x Super wife bakes for weddings or birthdays, x Soho House is the House engineer at the store for 1.5 years and has wrapped yesterday in an interview in the blink of an eye around her finger us: not just with their fantastic, juicy rhubarb Tartin (here goes recipe for), but above all with infinite power, their self-image of special quality and their infinite passion, the things a bit differently to tackle. And mint & berry grabbed this great woman: next Sunday, it is part of in addition to local flower specialists like mabb, gold leaf and poems & Posies of “mint & berry Flower Markets”, (you remember: the successor of our “ice cream markets”) and provides for the perfect combination of flowers and cake. What we also forward spot and what we should expect aka Tausendsuend Laura Ximena next Saturday at the first mint & berry Flower Market in Berlin is ’’s today in our sneak peak. Laura in a dress of mint & berry. Laura, you’re a self-proclaimed pastry artist. What exactly can we imagine including? I call pastry artist me simply because I’m a trained pastry chef, exactly this term but sums up my craft. You can find me now on the different street food markets and of course in the store of the Soho House. There, I put all my love in the craft, can live totally me and am quite happy about it. I worked always with food, cooked a long time, worked in Cafés and baked, I ‘ in between a few breaks and you got four children. I’ve taught everything myself in quite a long work and self determination and no classical training. Yes, and my love for flowers I started at some point, to combine my two passions. Also for very practical reasons: I’m just not the type for delicate sugar clothes work, also because there are flavorful enough. Real flowers have a very own dynamics and their own power – and I think that what’s fascinated me every time. How did you get that to marry flowers with cake? 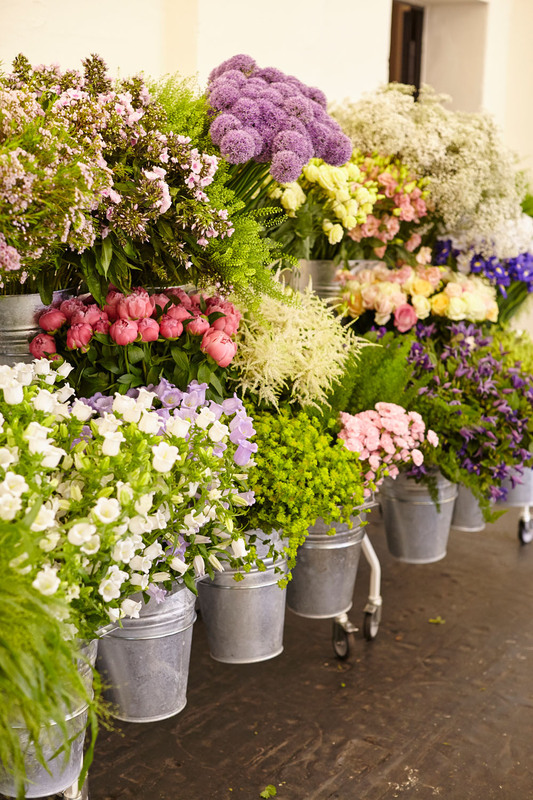 I was working in a flower shop a long time – and I loved it. I have always flowers at home and spending unlikely much money for – and when I started with the first wedding cake I baked, the idea came. Way with the artificial Ami stuff here with rougheren elements. I love fresh, seasonal products – and I love to use them quite different and inspired also by the different seasons. On the cake by the way almost exclusively ungespritzte flowers from Marzahn come – I finished templates as a base for all other. Ah, speaking of! Get to the by far most unpopular question: How do you get your inspiration? It sounds totally stupid, but it just gushing out of me. I just leave everything to me to come, visit like Nice markets such as the Kollwitzplatz and meet there terribly dear farmers, who have the funkiest things here, for example, vegetables of all shapes and colors, or edible flowers. The people themselves are the biggest source of inspiration but: whenever I bake cakes, I got advance with the people, to get to know them and to bring in experience, what they like. And already, the box goes to and the idea plop out. You are doing lots of vegan and were even 16 years vegan. Now, as not vegan but I must confess that I find the most vegangen baked goods often not so wow, although I am pleased with alternatives. Something’s missing – especially the sugar. Why? When I’m not, haha. I believe it is accompanied by the trend, that it’s a hip to live vegan – and: that even products without sugar are hip. Raw, vegan and sugar-free: eat and stay but slim. Is sweet for many out, what does not mean at this point, I would like to rail against intolerance. But it is a trend in many cases. And then bake for even many of my colleagues. Vegan long had a rather stale image and I tried at that time to give prejudice out of the way and show that vegan can be just quite as great as baked with eggs and milk aka the well-known cake from Grandma with lots of butter and more lard. Right next to the daily business at the store I take care of events, street food markets and private parties and catering – a pretty solid one-woman operation. I must confess that I have quite a bit of energy, but of course also often come to my limits. I have built up a very well functioning infrastructure over the last few years and the good fortune to have an incredibly great mother-in-law which always there is really, when we need them. But of course, We have a pretty tight logistics, likes coming to falter when a screw turns out. Then is ’ s juggle! This is beautiful but also that my husband is also independently and we both flexible to respond to falter. But Roger: It’s super busy. I must admit however that I am of the opinion that it is almost better works with many children because the children involved with each other simply also super, form a unit and i’ll ever need. Now we meet you at the weekend on the mint & berry Flower Market. Can you tell us already, what is there at your stand? , I am not yet set, but it will be sourdough waffles with security, belonging to my best sellers. Then is ’ s but of course still one, two, three show off cakes, to show you what I’m actually doing. Because ’ s handy is that I prepare, but before, so I completely out can give especially small appetizers. Friday and Saturday I will spend in the kitchen and most likely still time flexibly throw everything overboard. Maybe there is ’ s on Sunday in addition to my traditional things such as Brownies, Buiscuit or traditional also vegan or raw. Of course completely decorated with flowers and fruit. your dream project: I want a store where I unite flowers and cakes. An old factory Hall, an old wooden counter, cake and flowers. Most in 5 years. The best thing about your profession: All people who come to me, do something yourself or others. Pure luck. I have ‘ so clearly the best clients and customers – the best mood. And: that the craft is more appreciated. Cake no-go: Convenience products, gelatine and glaze (looks goofy and not taste), and Artificial Colourings. Cake trend: Vegan most likely. However Brownies and cookies adhere tenaciously, even if slowly even something new could come. Oh and of course flowers to put on the cake. Klaro. Your cakes are: pleasure, conviviality and the opportunity to celebrate the moment. They are not only beautiful, but also very sensual. More of Tausendsuend’s on Facebook, Tumblr & of course on Instagram. Next to Laura, and the above mentioned florists can be found on the „ mint & berry Flower Market “ also of course an exclusive pop-up store with the latest mint & berry summer collection, kreativworkshops with the flower artist Ruby Barber of Mary Lennox Bloomon, poems & Posies and of course music. On top is it woven macrame plant hangers by California Dreaming type, as well as ceramics, flowery and-kranze or the mint & berry flower Popsicles by Paletas. The places for the workshops are by the way participants limited and will be awarded in advance about www.mint-and-berry.com.